We use internal and client-facing listservs for email communication. PMs are responsible for setting up and maintaining project mailing lists. Under Basic Permissions: Check off "Allow new users not in civicactions". Under Posting Permissions: For the Post field select all options including "Anyone on the web" so that clients can email to the list and the list can be CC'd on other's emails. 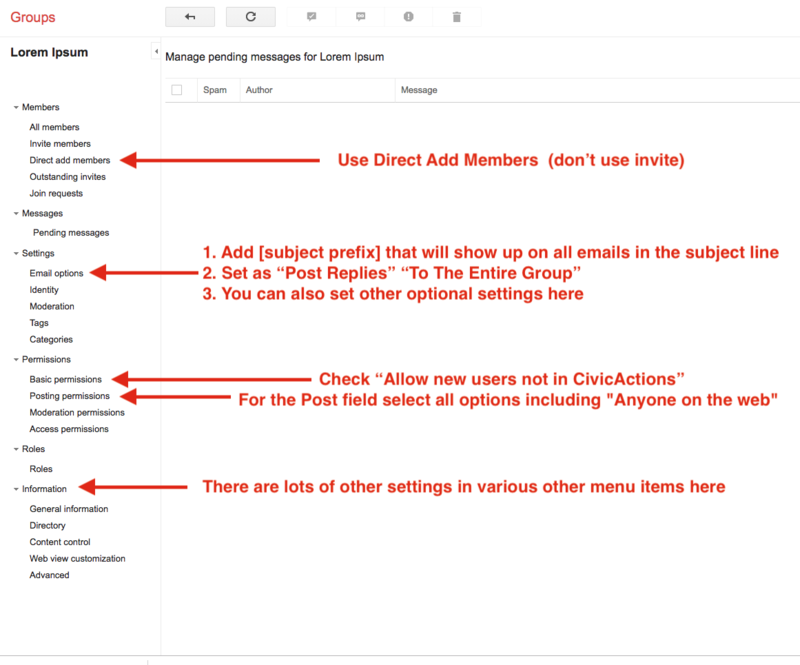 Under Email Options: You can set auto-replies, custom footers, etc. There are lots of other settings under other menu items. In most cases, you'll want to use "Direct add members" instead of "Invite members", so that invitees don't need to take any action. You can set a welcome message that should be sticky for future members that get added. Add [email protected] and [email protected] to every list you create.